There is something strangely pleasing about Ramen. Perhaps its the way the full flavoured broth bring warmth or how, the thick wavy noodles are simply made for slurping! And who is going to forget the melt in your mouth chashu and the seasoned egg with a runny centre. With ramen shops coming up all around town, the competition is no longer a 3 way battle between the popular Nao Ramen, Dosukoi Ramen and Arigataya Ramen. 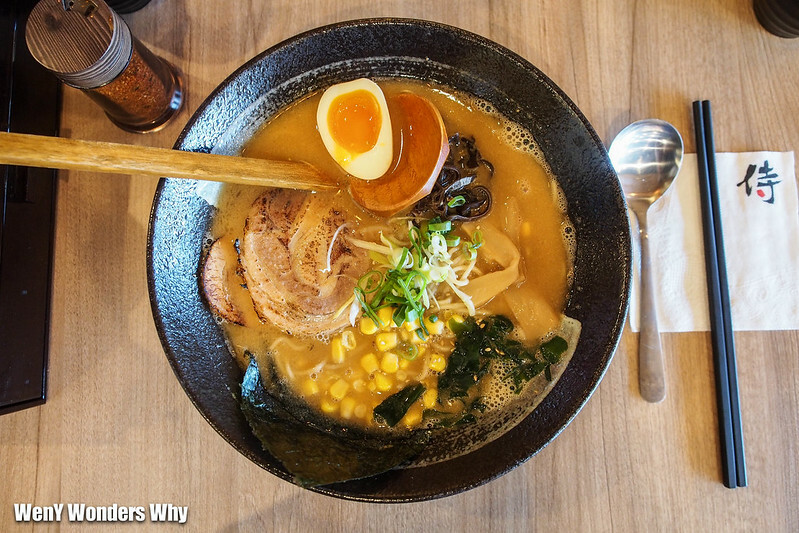 With Ramen Lab, Oishi Ramen and now Ramen Samurai in the equation, things are a little different. Two weeks ago I headed to Ramen Samurai in Victoria Park during their soft opening. Unlike most Ramen places, Ramen Samurai is not housed in a small dingy hole in a wall kind of shop. Instead, it has a generous eating space with chefs keen to prep up a meal! I had a choice 4 Ramen broths during Ramen Samurai's soft opening. They were the Miso, Spicy Miso, Kimchi and Curry Ramen. After having a good meal of Tonkatsu at Ramen Lab just days earlier, I decided to go for the Miso Ramen, $15. The assemble from the top is rather typical with the addition of corn kernels which are not my favourite. In saying that, they could have been cheeky and leave it out. I think Nao Ramen charges $1.50 for corn! Ramen Samurai’s handmade noodles are wavy and has a nice bite to it. The soup is super rich with a very prominent miso flavour in it. For those who do not take Miso too often, it might actually be a little overpowering and a tad gritty too. Still a good bowl of broth. The Chashu at Ramen Samurai was lovely! In fact, I think it deserves 1 point better as the skin had a more melt in your mouth touch, though not the best I had. When in Rome do as the Romans do. 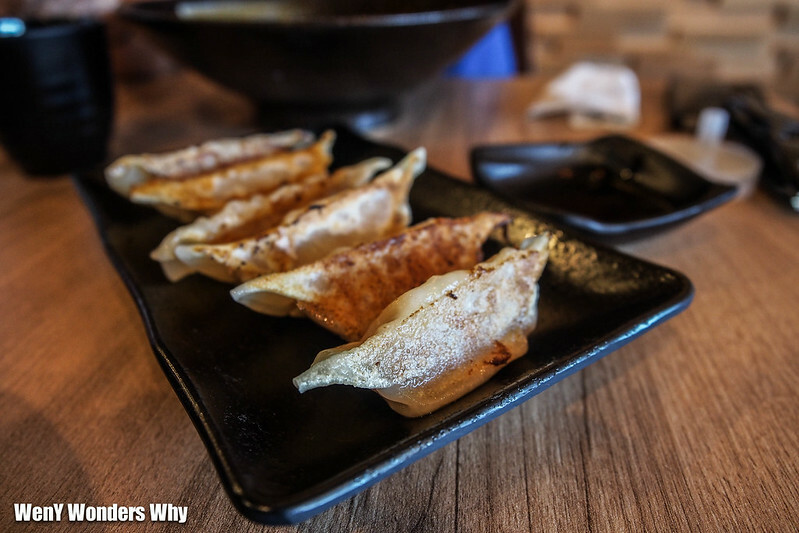 So when eating Ramen, eat Gyoza too! This was very typical Gyoza. I mean what was I expecting right? Ramen Samurai’s Gyoza is nicely charred on one side with the top kept perfectly white and slightly translucent. While it taste good, I wanted a bit more filling in them as the Gyozas felt a little “skinny”. So to me it did not deliver that burst of porky goodness in one bite that I like! In evaluating the enjoyment I had, the Miso Ramen’s broth delivered the kick I wanted. Its strong Miso flavour was slightly nutty but sweet at the same time. The sodium level was just right and it was nice! The egg was runny, but felt a little lacking? Maybe Soy? The egg did not have that balance between the Soy and Mirin. My meal at Ramen Samurai was nothing short of satisfactory. But was it a whole new level of ramen goodness? Perhaps this deserves a revisit! Delivering final judgement during Ramen Samurai’s soft opening would be too harsh. See my other ramen post below :)!